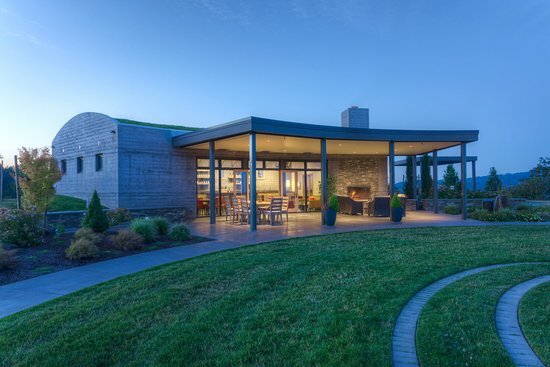 I’ve been a long-time super-fan of Oregon Chardonnay, heralding its distinctive site-expressive ways and claiming that it has dug its roots deep into the soils of the Willamette Valley – stimulating its characteristics to reach optimal crispness and freshness. With its racy acidity, distinct minerality, elegant texture and bright fruit, cool-climate Oregon Chardonnay is truly unmatched. 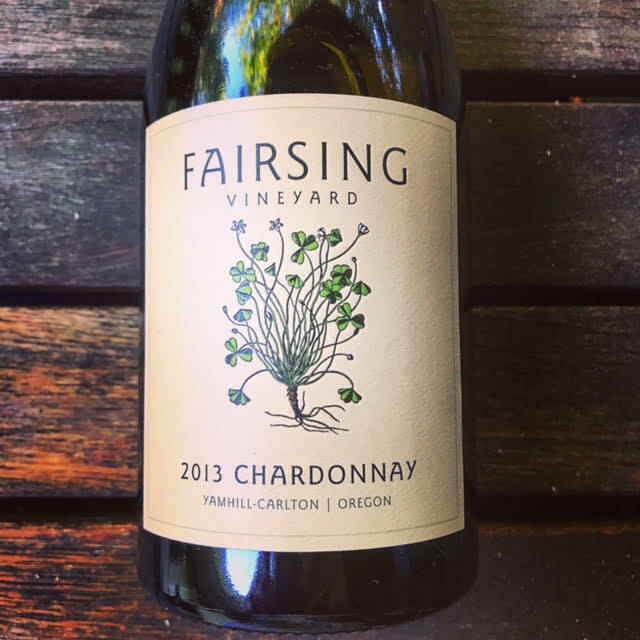 Fairsing Vineyard’s 2013 Chardonnay embodies everything I love about Oregon Chardonnay. It’s crisp, fresh and has vibrant solid acidity. Lush, juicy layered waves of stone fruit, Key limes, sea spray and hazelnuts – match the exhilarating aromas – and flow from the front of the palate to the back in absolute tasty delight. The finish is long, and another sip is simply irresistible. 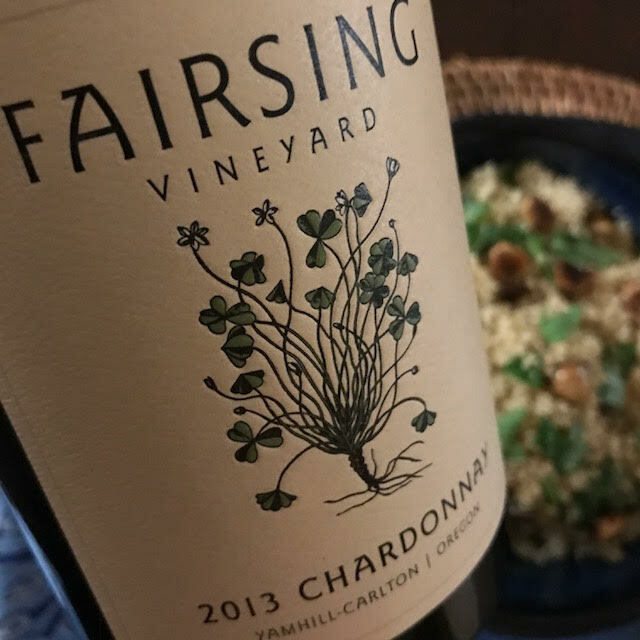 Beautifully balanced, Fairsing’s Chardonnay could pair well with an array of flavors. 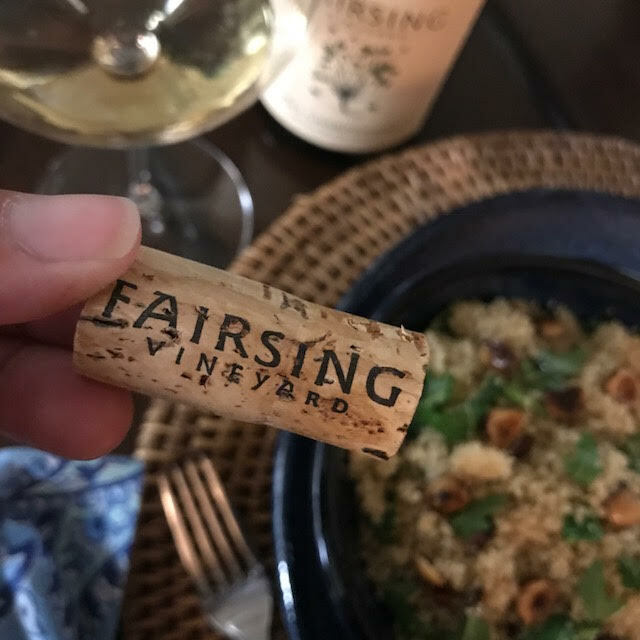 The hazelnut characteristic in the wine made me think of one of my favorite summer dishes: Brown Butter Hazelnut & Arugula CousCous. 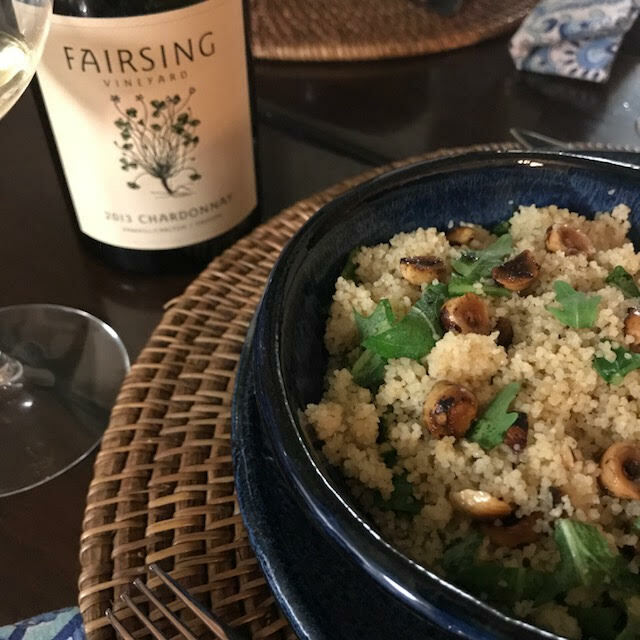 Both the couscous and the Chardonnay are crisp, light and refreshing, so it makes for a pairing that’s wholly balanced and purely blissful on a hot summer evening. 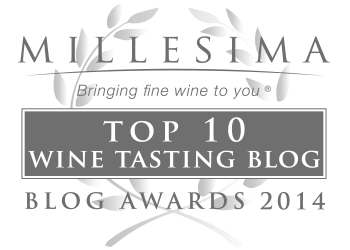 “Our 2013 Estate Chardonnay is the product of an exhilarating growing year. Fairsing Vineyard observed bud break in mid-April, which was more than a week ahead of schedule and early May brought replenishing rain. Saturating sunshine and warm temperatures persisted from mid-to-late summer and provided excellent ripening. Verásion began in early August and the grapes progressed to full color by the first of September. This 2013 Estate Chardonnay was harvested September 19, just before a major shift in the weather. Whole-cluster pressed upon harvest, this combination of Dijon clones 76 and 95 was fermented to dryness in specifically chosen new and used French oak barrels, with a total new-oak percentage of approximately 20%. The wine was allowed to complete malolactic fermentation and was aged in barrel for 10 months until bottled August 21, 2014. Cook couscous according to instructions, set aside. Brown butter in skillet and add hazelnuts, stirring constantly until aromatic and browned. 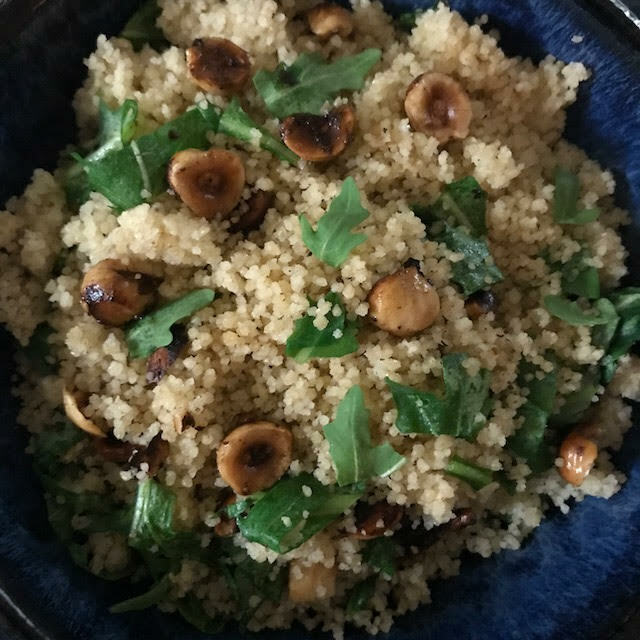 Pour hazelnuts, browned butter and lemon juice over couscous and stir. Add arugula, Jacobsen Lemon Zest salt and pepper. Mix well. 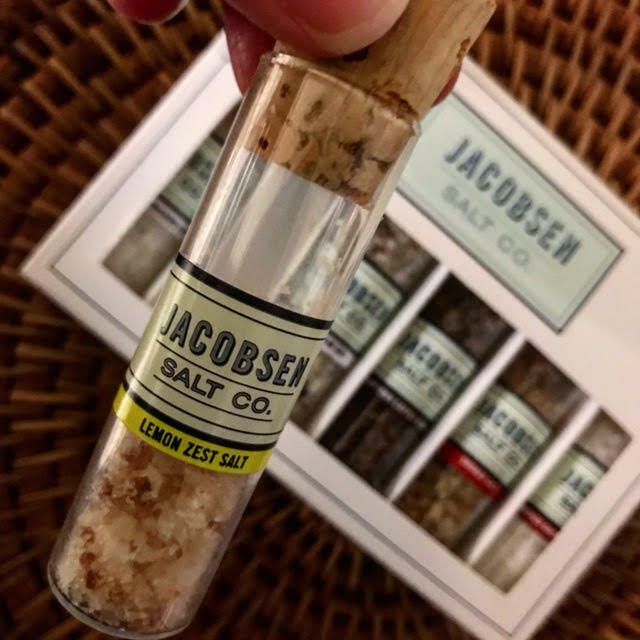 The salt I cannot live without – and the secret ingredient to all great recipes. Serve with chilled Fairsing Chardonnay (preferably in an Oregon Pinot Noir glass – we will discuss this later) on a hot summer evening. Enjoy. Every. Bite. And. Sip. The perfect pairing on a hot summer night.